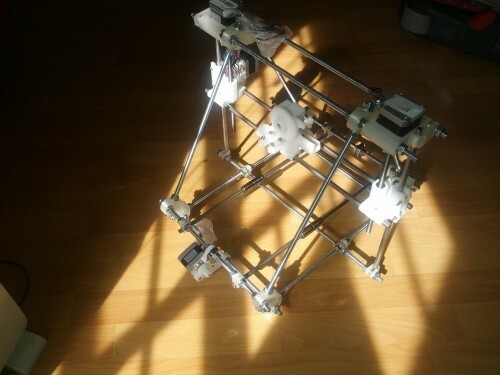 It’s my RepRap Prusa Mendel 3D printer – I purchased most of the parts, loosely assembled, back at the end of last year before I moved to Johannesburg. It took me a while to source the bits I didn’t have – motors, electronics and so on – and I’m still missing a sheet of glass for the print bed. Today’s been the first time I’ve had chance to work on it for a while, and progress is good. In terms of the structure there’s nothing left to add barring the belts, pulleys and print bed. Tomorrow I need to start soldering together the electronics – bought as a kit from Open Hardware.